It’s not just the colour and logo of Orange amps which makes them stand out, their tone has made them a favourite of guitar players everywhere. When founder, Cliff Cooper started designing the circuitry for a new guitar amplifier in 1968, little did he know that he would be responsible for some of the best-loved amplifiers of the next several decades. Cooper fell into designing designing amplifiers almost by accident. His music store in New Compton Street, London traded in used equipment but difficulty in getting stock drove Cooper to decide to build his own kit. The first Orange amps were designed by Cooper and built in Huddersfield by Mat Mathias’ company, Radio Craft. A few months later, a salesman in the Orange shop, Mick Dines, a bass player who was well aware of the problems musicians faced transporting kit around in the back of a van, started work helping out with the design of Orange’s speaker cabinets. Focusing on making the speaker grilles as robust and hard-wearing as possible, Dines chose a basket weave material for the front of the cabinets. ‘Orange speaker cabinets could now certainly take the knocks and were appreciated by the roadies. Guitarists loved the “thickened” sound that the Basketweave helped to create. What’s more, the Orange 4×12 [a cabinet fitted with four 12” speakers inside] was 15” deep , until then, 14” was the norm. This extra depth also helped to define the distinctive “Orange sound,” explains Orange on its website. 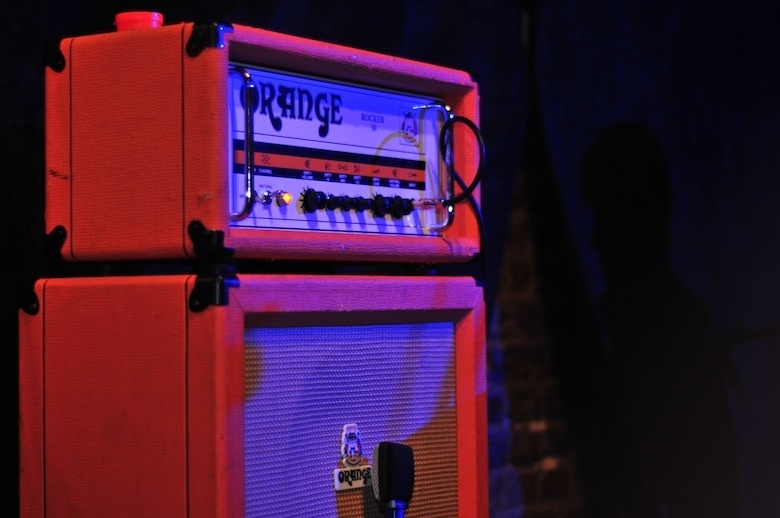 In addition to their sound, Orange amplifiers are known for their graphic symbols, used instead of names for its amps and inspired by the new, symbol-only, road signs of the late Sixties. ‘In 1971, I suggested to the team that instead of using words we should use our own custom symbols, I wanted us to keep one step ahead. Years later, when we started manufacturing again in the 1990s, we decided to keep the graphics – these hieroglyphs were now a part of the brand,’ explains Cooper. While Orange is best-known for the warm, crunchy tone of its valve amps, it pioneered the use of transistors in guitar amplification and in the mid-Seventies the Orange Music Electronic Company (OMEC) was formed. Despite what seems now like almost prehistoric technology, OMEC produced the world’s first digital programmable amp before the end of the decade. Among its other amps was the Jimmy Bean, a denim-clad transistor amp. Production moved from Huddersfield to Covent Garden and then to Kent, before ceasing altogether in 1979. During the 80s Cooper built limited numbers of amps to order and in 1992 the Orange name was licensed to Gibson. Happily, Cooper re-took control of the Orange brand in 1997 and began producing amplifiers on a large scale again, helped by a certain Noel Gallagher, who had used Orange amps on early Oasis albums.